These are perfect little treats for after school. 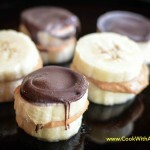 It’s the ultimate combo: peanut butter, banana, and a bit of chocolate. These are so easy, and they’re one of the first things my sister and I ever made on our own to practice “knife skills” with a butter knife. We named these “Fronanas” (short for Frozen Bananas) and it’s stuck at our house ever since. Peel the banana and trim the ends. Cut the banana crosswise into 1/4-inch/6 mm slices. Melt the chocolate chips in the microwave on HIGH, stirring every 15 seconds until smooth, 1 to 2 minutes. 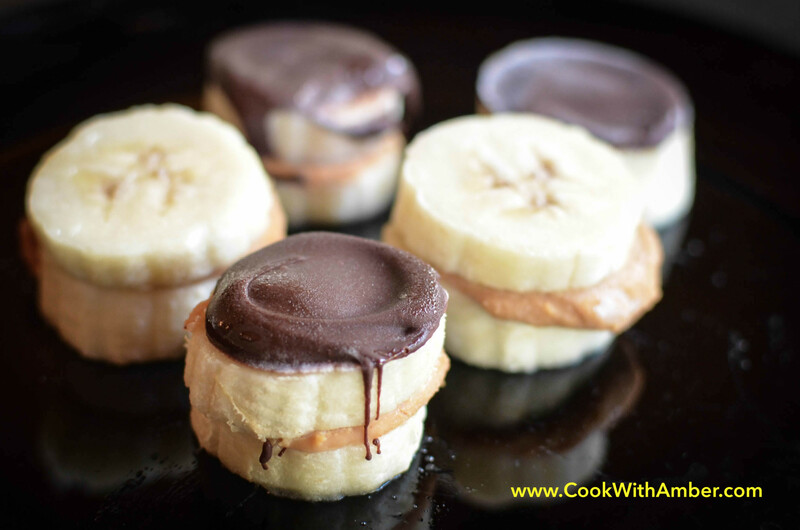 Spread a dollop of chocolate over the top of each Fronana. It looks especially cool if you let some of the chocolate drizzle down the side. Freeze until firm. I saw you and your sister on the news a few weeks ago and saw you making these yummy little bites. I made some tonight to see how they went, my plan is to make them with my 4 year old grandson. He loves to be in the kitchen cooking with mom and me. When I saw that your sister could make these it really inspired me to try it with him. Thanks again for the neat recipe. Take Care, garnette. Hi Ananya! That is so great that you guys are loving them! Thank you so so much!